The first edition of Timisoara LatinFest kicked off on Saturday, October 9 at Casa Da Vino with delicious food, great wine and a relaxed party atmosphere. The gala event was attended by His Excellency Francesco Catania, the Italian consul-general in Timisoara, Mr. Stephane Re, the director of Timisoara's French Cultural Centre, local and foreign businesspeople, as well as journalists and members of the HIT Association. 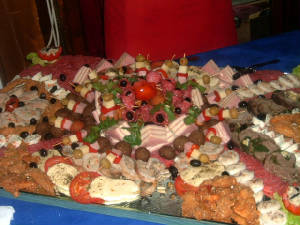 Guests of the LatinFest were offered an all-you-can-eat menu starting with a cold buffet, which included many Romanian delicacies prepared for the event by American Catering Network. The main dish was a specialty from the Italian region of Veneto - arrista di maiale al forno , or oven-baked pork cutlets in wine sauce and country potatoes - cooked for the gala by Mr. Americo Zuccato, owner of Ristorante Paradiso Italiano (http://paradisoitaliano.tripod.com). To top it all off, guests were treated to the best gourmet cakes in the city, such as marzipan cream , choco-profiteroles cake and caramel crowned "grilias" supplied by Trandafirul laboratory, as well as to a great selection of red wines from Casa Da Vino and whites from the house of Cotnari. Italian, Romanian and French pop tunes selected by one of Timisoara's up-and-coming DJ's created a warm and relaxed Latin party atmosphere. 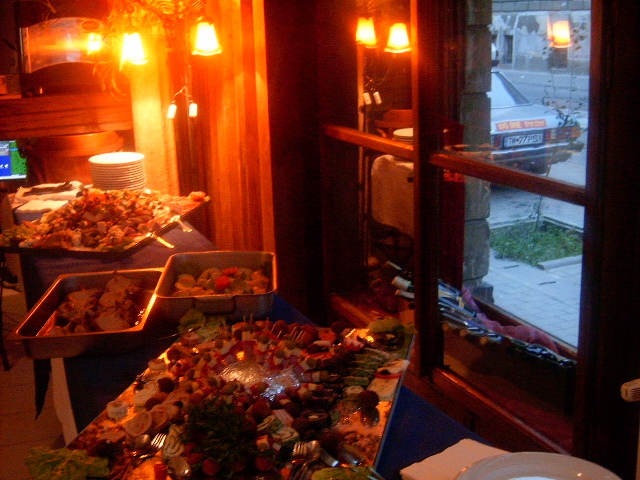 On Sunday, October 10, the party continued in the more elegant and formal Flora de Fanti restaurant. This time around, Mr. Zuccato's Venetian dish was complemented by a great selection of warm and cold appetizers prepared for the occasion by Mr. Nicolae Gustere, the son of the best-known Master of Culinary art in Timisoara, Mr. Vasile Gustere. Flora's band contributed to the refinement of the party with its cafe-concert brand of hits. The Sunday party was attended by Mr. Nistor, director of Selgros Cash & Carry Timisoara, Mr. Kovacs, the editor-in-chief of the Agenda media group, Mr Cornel Hodor of Valahia Restaurant, Mr & Mrs Grecu of Recreation Travel, as well as other leading members of Timisoara's business community. Towards the end of the evening, HIT's Executive Director awarded the title of Honorary President of the Association to Mr. Americo Zuccato, and the Hospitality Industry Entrepreneur of the Year award to Mr. Cristian Iuhas, the owner of Flora de Fanti restaurant and of De Fanti Gelateria. The LatinFest continues for an entire week, with promotional offers of free glasses of Cotnari wine and Latin-type menus at 9 other HIT member-restaurants in the centre and suburbs of Timisoara.